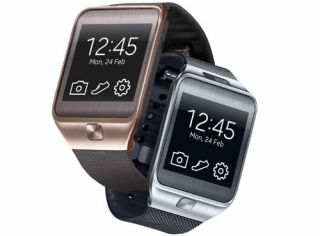 MWC 2014: Samsung reveals Gear 2 and Gear 2 Neo | What Hi-Fi? Samsung is wasting no time in announcing its new products at MWC 2014, which gets under way today in Barcelona. First out of the blocks are two new additions to the increasingly popular wearables market, the Gear 2 and Gear 2 Neo smartwatches, which follow in the footsteps of the Galaxy Gear launched at IFA last year. Samsung has confirmed it's dropped the Galaxy branding from these smart watches. The two second-generation models bring a wealth of functionality and features to your wrist, acting as companion devices for your phone or tablet, and also work with other AV devices and electronics. Both the Gear 2 and the Gear 2 Neo strap round your wrist and sport 1.6in AMOLED screens. The Gear 2 has a 2 megapixel camera in the screen. As well as taking pictures, the new Samsung wearables have intergrated music players, 4GB internal storage, and work with Bluetooth headphones. A built-in IR LED sensor allows you to control your TV, set-top box and other AV devices, while you can see notifications from calls, texts and more. Elsewhere there are a range of fitness features – a heart rate sensor, pedometer, running apps and more – and assorted basic apps such as a calculator, stopwatch, timer and more. With Apple likely to release its iWatch later this year, to join smartwatches from Pebble, Sony and others, the category looks likely to be an increasingly popular one. And, like tablets and smartphones, wearables will impact on, and interact with, products across the AV world. We'll be reporting from Mobile World Congress in Barcelona from today and in to next week, so look out for news, pictures and hands-on reviews of the most interesting phones and tablets, with our usual focus on audio and video performance.